The e-bikes are being pulled from Washington, D.C. and San Francisco, but the main city hit is New York, which has seen the most aggressive e-bike rollout. In only a few months, Citi Bike has added some 1,000 e-bikes to the fleet and they planned to roll out an additional 3,000 by June. The news of the recall was first announced on the Citi Bike website, stating that the bikes were pulled because of “a small number of reports from riders who experienced stronger than expected braking force on the front wheel.” Similar messages were later posted on the Ford GoBike (San Francisco) and Capital Bikeshare (DC) websites. The company says they’re removing the e-bikes “out of an abundance of caution” and that the move is proactive. Bill Somers, who lives near Columbus Circle, said he broke his hip after flying head-over-handlebars when he lightly tapped the front brake on his pedal-assist Citi Bike. 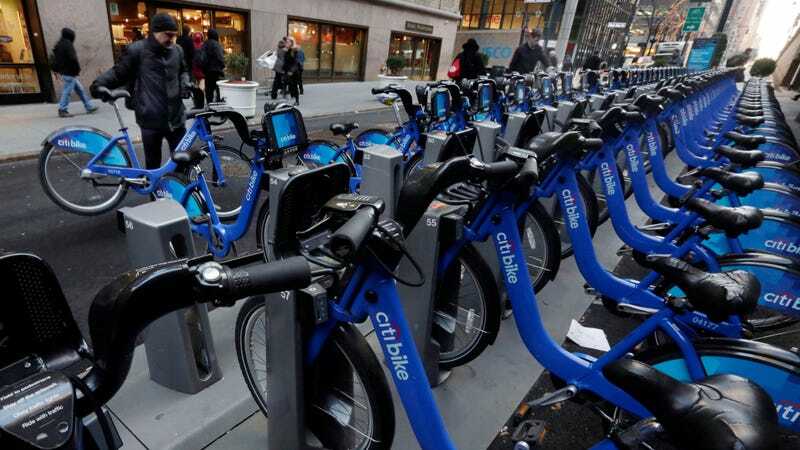 Somers said he has regularly ridden a bike since he was a child and was a Citi Bike member for years, who had experience with its pedal-assist bikes before the March 17 incident. “I literally touched [the brake] with two of my fingers and it locked up,” said Somers, who described attempting to brake while biking along Central Park West and noticing a car edge out onto the road from the intersection with 61st Street. This may seem like a puzzling reaction. Surely anyone would be happy to take a commute twice as long in exchange for a higher probability of not being injured during it. But it’s worth remembering we’re talking about bicycling in major cities, a means of transportation that is far more dangerous than it ought to be due to city governments that don’t adequately separate bikes from traffic even on brand-new bike lanes. So the long odds of a front wheel locking up pale in comparison to the much better odds of getting hit by a box truck. Anyways, it’s not like driving is a paragon of safety itself.